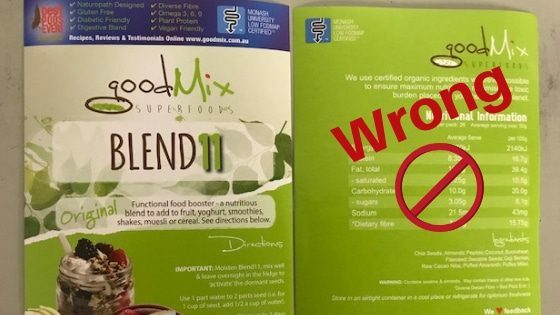 The Blend11 nutritional panel is incorrect! Yay!! We have an exciting update from the CSIRO gut researchers! Our nutritional panel calculations for Blend11 are incorrect – but it’s in a good way! This means that for 6 years, we’ve been selling our product with a label stating 3x the sugar content it actually contains, & the fibre content is significantly higher than we’ve listed too! (Yes, we feel really, really clever). It was so long ago that Brad & I can’t remember who’s mistake it was (I say it was him, he says it was me), but either way…it was a pretty huge error & is great news for anyone needing to decrease sugar & carb intake, (that’s pretty much all of us), but especially diabetics, those battling with insulin resistance, abdominal fat, PCOS, & keto dieters. The news came in from CSIRO via email just hours after a big box of new Blend11 labels had arrived from the printers, wouldn’t you know it! So for now, all we can do is let everyone know that the current panel is inaccurate (in a good way), & we’ll be sending out some correction strips / replacement labels ASAP. And – we can now eat 3x the amount we normally would, carb-guilt free! The keto diet (high fat, moderate protein & very low carbs) was trendy for weightloss in natural health circles approx 20 yrs ago & it seems that everyone is trying keto again – this time in a big way due to quick & easy spread of info & recipes through social media etc, plus more scientific research into the benefits & safety. This is great from a weightloss & insulin sensitivity perspective (it can really help), & the perfect pendulum swing to combat the low fat damage done over the past few decades! But, going keto is not for everyone, & can be a little worrying from a gut microbiome perspective if the dieter isn’t aware of some possible pitfalls. It can help starve out SIBO / decrease numbers of some of the nasty gut organisms, but with less types of plant food coming into the bowel, you’ll potentially be sacrificing some of your helpful bugs also. The concern is that when we tip the dietary balance too far towards fat & neglect to include plenty of fibre & resistant starch, the poor little gut bugs get so hungry that they’re forced to munch into the protective mucous lining of the gut. Not a good situation to bring on! (Hello leaky gut). 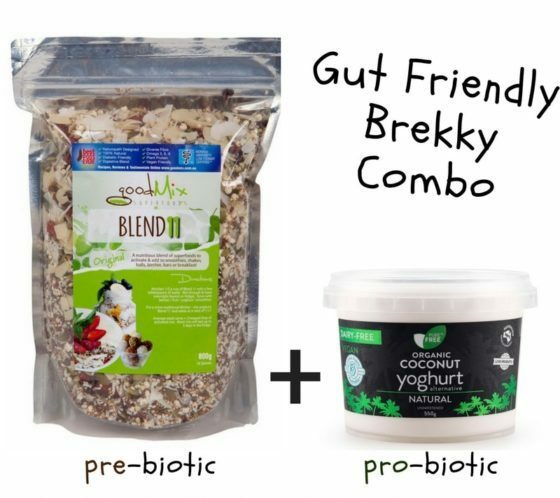 One of the keys to ‘gut-healthy keto’ is getting plenty of fibre-rich plant food, supporting a diverse microbiome to keep the fermentation of fibre into short chain fatty acids happening & maintain the all important gut lining – not to mention the equally important regular bowel movements! Both constipation & loose stools can be an issue whilst adjusting to a fat-heavy keto diet, & many new-to-keto people will experience both if not mindful of their fibre intake. Overall though – you can really help support gut health with a careful keto period, because you’ll be cutting out sugar, refined carb & gluten-heavy foods (just watch over consumption of dairy as that can do bad things for many people’s gut)! Activated Blend11 sprinkled over a plate of eggs, raw spinach, plus mushrooms & herbs sautéed in olive oil, coconut oil or butter. Asparagus sauteed in butter / oil, plus sea salt & garlic also make a great keto friendly & prebiotic rich breakfast side too, esp this time of year with asparagus being cheap & plentiful! Activated Blend11 plus Pure n Free unsweetened coconut yoghurt, a few frozen berries & a little water into a smoothie. You can also try coffee instead of berries to flavour. This testimonial came in from my brother Andy in the USA, who’s been doing a great job spreading the seeds over there! Please keep letting all of your USA friends & family know that Blend11 can be purchased through amazon prime in the States. You’ll get FREE SHIPPING on any Blend11 400g, 800g & 1.3kg orders , PLUS 15% OFF. Help us clear out the old labels!! !